We have quite a few guests each year travel with us who are interested in birding while on their rafting adventure. The most common wildlife you’ll see in the canyon are birds. We thought it would be helpful to share just a few Grand Canyon birding tips for those interested! Throughout the season in Grand Canyon, the types of birds you see and songs you will hear change. In the early spring and fall, there are more migrating water fowl. In the summer, you will see a plethora of small songbirds. Birds migrate because of food resources. In particular, birds that eat mostly insects migrate to areas where insect resources are better. During their breeding season, birds need lots of extra food for their fledglings, so they migrate to where food is plentiful. In the colder months, it is too inhospitable for most bug life (in particular flying insects) in the canyon, which means flying insects’ peak breeding seasons are in the spring and summer. Therefore birds that mostly feed on flying insects will be found when those bugs are abundant. It might seem challenging to identify birds, but all it takes is paying attention (take these Grand Canyon birding tips with you on your adventure!). There are many birds you can identify by only sound or a quick glance. Of course, binoculars are key to identifying birds, so if you have a keen interest in learning, a good pair of binoculars are essential. Although there is still a lot you can learn without investing in binoculars, which are a great item to bring on your rafting adventure in the canyon. 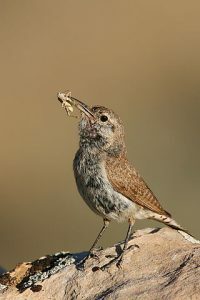 To get you started on our Grand Canyon birding tips, we figured we’d start with the very distinctive canyon wren’s song. The descending scale of the male canyon wren’s song are easily identifiable year round and you will almost certainly hear and learn their song on your rafting adventure. Follow the links below to listen to the songs of both the male and the female canyon wren. Below are some more tips on 4 common birds that you might be able to identify while on your Grand Canyon rafting adventure. These are all easily identified by song or sight in the canyon. Calls will really be helpful when attempting to identify the first 3 birds on this list. Also, view the videos in the attached links for each bird to see flight and/or walking behaviors. Many of our repeat rafting participants know the canyon wren by sight and sound, but they may not realize the rock wren is just as common and almost as easy to identify by sound. 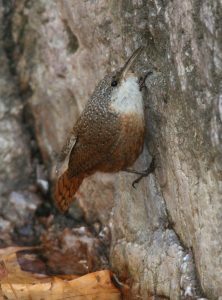 The rock wren is very similar in shape and only slightly bigger than the canyon wren. However, it is a drab spotted grey/brown compared to the canyon wren’s bright rust and contrasting white breast. Like the canyon wren, the rock wren can be found year-round in the canyon, as the majority of its food are spiders, beetles and other non-flying insects that inhabit the canyon year-round. It is commonly seen hopping amongst the rocks and talus slopes just a few yards above river level. Once you have observed a rock wren singing or calling, you will not mistake its song or call. Even though the males have a huge repertoire of songs, all their calls/songs have a similar repeated buzzy, metallic sound. Interesting facts: rock wrens do not need to drink water, and they build a pavement or walkway of small, flat stones or pebbles that leads to the nest cavity, usually located in rock crevices. The black phoebes and says phoebes are commonly seen flitting out over the river and back to their viewing perches in the summer months. However, the ash throated flycatcher, another bird in the same family of tyrant flycatchers is quite common in late spring and summer. You are more likely to see it higher up in the trees, and not as close to the river as the says and black phoebes. From a distance, the ash throated is a grey non-descript bird, but its call is quite distinctive. There is no need to see this bird once you have identified its simple call or song. Males sing a repeated series of gurgling, burry notes just before dawn during the breeding season. Their non-musical song changes in pitch from high to low, and sounds rather bumpy and stuttered, as if they were sputtering through a toy whistle. 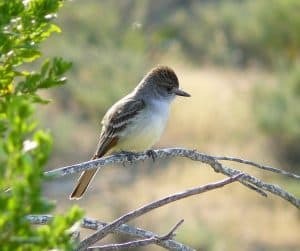 Interesting facts: the oldest know ash throated flycatcher was almost 12 years old, and they do not need to drink water. These shorebirds are very common along the beaches during spring and summer months, either solo or in pairs. At first glance, they are simple, grey and non-descript (therefore difficult to spot). Once you recognize their repetitive call, bobbing walking movements or staccato flight, you will start seeing them everywhere. Along the shore, they are seen walking in meandering paths and suddenly darting at prey. They are constantly bobbing their tail end in a smooth motion. Their flight style is equally distinctive: low over the water with stuttering bursts of fast wing beats, interspersed with very brief glides. They’re often noticeably giving a repetitive weet weet weet call (listen to the link below). 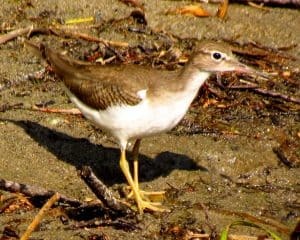 Interesting fact: spotted sandpipers were one of the first bird species described in which the roles of the males and females are reversed. Males tend the nest and care for young. The females fight for territories and may be polyandrous, meaning they mate with more than one male. A red-tailed hawk is relatively easy to distinguish by their red tail. However, the juveniles do not have the red tail. Additionally, sometimes in certain light you cannot see the red tail on adults. A sure way to identify a red-tail hawk without the classic red tail is by the leading edge of the wings. There, you will find two dark patches. This is assuming it is not the very rare melanistic/dark or leucristic/white forms. 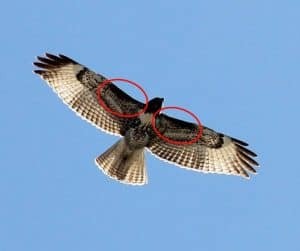 No other North American hawk has these dark patches in this area, circled in photo below. You may still need binoculars to see these patches if the hawk is very far away. Interesting fact: red tails are voice over movie stars. The red-tailed hawk has a thrilling, raspy scream that sounds exactly like a raptor should sound. At least, that’s what Hollywood directors seem to think. Whenever a hawk or eagle appears onscreen, no matter what species, the shrill cry on the soundtrack is almost always a red tail hawk. For more general birding tips, you can visit https://www.allaboutbirds.org/, and search for the bird you’d like to research more. We hope these Grand Canyon birding tips were helpful to you! Like what you see on the AzRA blog? Sign up here to receive an email notification when a new article posts. Email used for article notifications only. Great Article on Grand Canyon Birds!